Note: SoftServe is a digital services and software development company, headquartered in Austin, Tx and in Lviv, Ukraine. The author, Stuart Logan, is the company’s CHRO. SoftServe has a history of finding efficient, collaborative and engaging communication tools for all its employees located in over 30 offices and locations in Europe and the USA. We have come a long way from developing our own platform from scratch to using an up-to-date, globally recognized tool that aligns our current goals and satisfies our needs. But let’s see how it all happened step-by-step. SoftServe is a 4,100-employee digital services company with high annual growth rates. The company’s focus on digital transformation, at all levels of its operation, has a big impact on the organization’s internal tools and processes. While offering digital services to our clients, we are fostering the same digital approach inside our organization – modern-day tools for the modern-day company. With a new internal communication tool, we wanted to ensure two-sided communication, have a well-known and intuitive interface and be able to access the tool from any device, including mobile. The communication tool we were using could no longer support our needs and scale our growth. When I joined SoftServe last year, email announcements were often used for social purposes. At first I thought this was a great way to understand what was going on, but after a few weeks, it became a distracting factor for me and those employees who wanted their mail to be strictly work-related. All of the above motivated the company to find a tool that will scale with our growth and satisfy our current as well as future communication needs. Workplace by Facebook promised to solve many of the key communication issues that SoftServe was experiencing. The communication finally promised to be multi-faceted; the tool was easily recognizable (most employees already used Facebook) with an intuitive and well-known interface. Moreover, the tool presented a great opportunity to decrease the amount of social news in employees’ mailboxes, by turning email communication into something more lively and personalized, with quick feedback and emotional engagement. Workplace’s communication approach using groups easily fit into our organizational structure and general project teamwork approach. In addition, Workplace provides detailed statistics that proved to be an effective tool for the SoftServe Communications team. The overall Workplace implementation process at SoftServe lasted one month, which was a record implementation for our company. The 17 team members involved in the implementation included representatives from legal, IT, information security departments and the communication team. The first step towards adjusting the group-based communication approach to fit the SoftServe structure was designing the group matrix. The general goal of the matrix was to create location and department groups as defaults, meaning employees were automatically assigned by the system to groups corresponding to their department, city / development center and country. Each group had one or two moderators who were responsible for overseeing the group’s content. The next step in preparing for launch was the “Early Champions” phase. This important step, which included gaining support from 10% of the company’s most active communicators from all levels, was suggested by the Facebook team to ensure a successful launch. We selected a group of around 400 employees (group administrators, company opinion leaders and active communicators) to create groups, fill them with interesting and relevant content prior to launch, and promote the tool after the launch. The Facebook team provided the initial training for the Early Champions. They received access to the platform one and a-half weeks prior to its official launch. This way they were able to test the environment, create initial groups and simply play around with the tool. An important factor was the commitment of the Champions to filling the groups they created, as well as official groups they were moderating, with content. Posts, engaging videos, polls and different giveaways were ready for the rest of the users on launch day. Early engagement from the most socially active employees of the company helped build trust around the platform and increase overall interest. Employees visiting the platform at launch found it interesting enough to stay tuned in and return to it repeatedly. Higher management involvement was also crucial for a successful implementation. Informal teasers and a sequence of formal news via email created a flurry of excitement before we launched. After launch, the continued communication on Workplace captured the employees’ attention making it a very lively communication channel at all levels of the organization. The launch day greeted all employees of the company, at all locations, with colorful office decorations welcoming the new tool to SoftServe. The IT support team made sure that all employee profiles were ready and filled with their basic information before users first visited Workplace. Another important step was sending an email to all employees from our CEO, Chris Baker, the day before launch. He described the main goals for Workplace, encouraged employees to communicate on the platform, and promised to stay in constant communication himself. Chris also informed employees about the invitations they would receive the next day from Workplace. Having a technical and deeply analytical mindset, SoftServe employees are usually suspicious of unknown links or emails from external addresses, so this notification was important to ensure trust in the new tool. It is important to note that the implementation team predicted the need for a way to quickly and effectively respond to support questions from employees. A Q&A group was created and from day one all employees were subscribed to it by default. Here, our workgroup and the Workplace team effectively answered employee questions. The successful launch of Workplace would be impossible without great support from the Facebook team throughout the preparation for launch, as well as the implementation process. Early training for the implementation team, as well as Early Champions training, management team training and constant support at all stages, greatly contributed to a successful launch. Workplace quickly evolved into an effective tool uniting our big and widely dispersed company. The recent engagement rate shows that 84% of the company’s employees are active users, with over 200 active groups. Our management team is able to announce news in an informal way and receive quick responses from employees. Live streaming sessions are useful during training sessions, management meetings, department meetings, etc. Thanks to Workplace, our employees and management have become closer; communication has become more systematic, quicker and easier. We communicate, tell jokes, discuss news and generate ideas simultaneously and all within one environment. It is hard to underestimate the importance of this platform for a company like SoftServe, operating in over 30 locations. In addition, employees now have a place for close and easy collaboration, teamwork, as well as a platform to share their interests and insights. The tool also turned out to be a very effective recognition platform, where positive feedback about SoftServe employees is shared company wide and employees are able to receive immediate comments and congratulation notes from the CEO and top management. It has only been only a few months since our launch, and we have been ecstatic by the user penetration we have achieved in such a short time. Out of 4.1k users we have 3.4k monthly users. We are already holding brainstorming sessions to support improving areas like mobile adoption, group cleansing and looking at which communications need to be supported with email announcements, as we have found that going 100% social media-focused does not reach the whole company. Workplace appears to perfectly meet the needs SoftServe has towards a collaboration and communication tool, and in many ways even exceeds our initial expectations. We are looking to improve in areas that uniquely match our company’s deep software engineering and technological roots. We see an opportunity to explore the relationship of how digitally engaged an employee is on other data analytics, such as performance and attrition, as well as using machine learning algorithms to see if there are any other insights that can be gained to improve our competitive advantage. We also see an opportunity to create a socially driven employee recognition platform that would be intrinsically connected to Workplace. 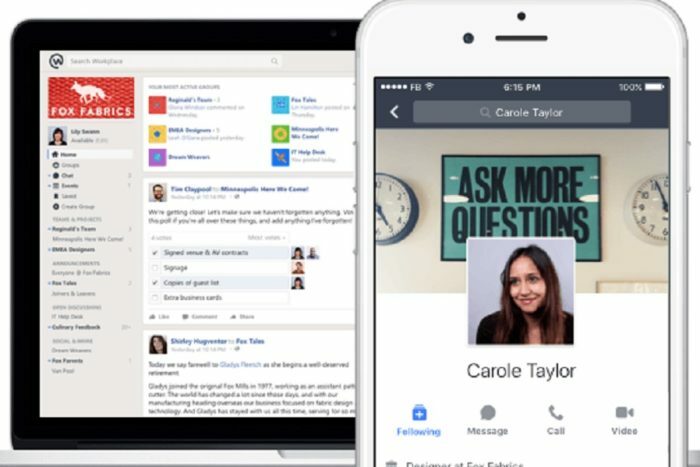 We look forward to becoming even more successful during our digital transformation process and we believe that Facebook is a critical partner and Workplace a critical tool in our ecosystem to support our associates and SoftServe’s growth. Stuart Logan is Chief Human Resources Officer at SoftServe. He joined the company in June 2016, after four years as VP Human Resources (Americas & European Region, Products, IT and Sales) & HRIS/HRSS with Tata Communications, a global telecommunications company. Earlier in his career, he also worked in HR leadership roles at Avaya, and Cisco Systems.